Alarming Number Of Women Think Spousal Abuse Is Sometimes OK : Goats and Soda In many countries, more than a third of women think a husband is sometimes justified in beating his wife. Researchers say this attitude contributes to the high rate of domestic violence worldwide. Domestic violence is never OK. Yet in 29 countries around the world, one-third or more of men say it can be acceptable for a husband to "beat his wife." Perhaps more surprising: In 19 countries, one-third or more of women agree that a husband who beats his wife may be justified, at least some of the time. The data come from polling performed from 2010 through 2014 for the World Values Survey — an extensive study of attitudes in almost 100 countries, conducted on an ongoing basis since 1981. The study is led by an international network of researchers based in Stockholm. 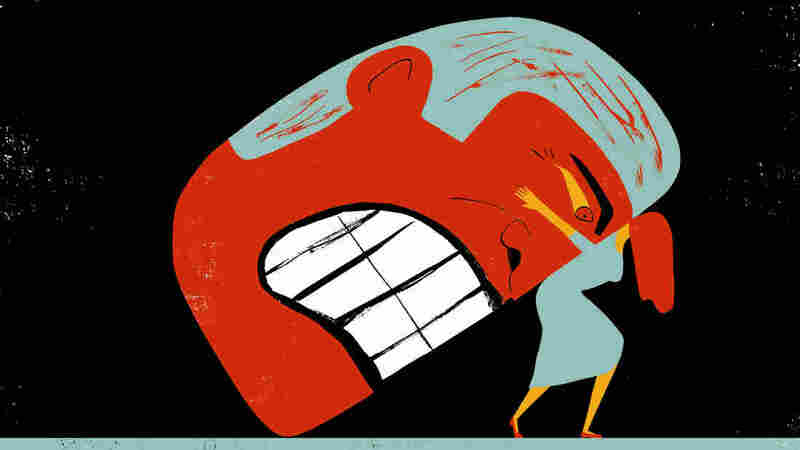 The findings — and others like them — point at just how culturally acceptable domestic violence remains in many countries, says Rachel Tulchin, a policy adviser on gender issues at the Clinton Foundation. Tulchin recently contributed to a report by the Clinton Foundation and the Bill & Melinda Gates Foundation, which cited the World Values Survey data. In some communities, Tulchin notes, it's considered a woman's duty to do all the housekeeping. A wife is expected to ask a husband's permission before leaving the house or simply to never argue back. So in these communities, a man who hits his wife for violating the rules is going to seem normal, she says. "It's a view that's held by the whole community. And that obviously is going to include women and girls themselves." The cultural acceptance of spousal abuse can be so pervasive that in some countries, large majorities of women say it's acceptable. In Rwanda, 96 percent of women say the practice can be justified, according to the World Values Survey. About two-thirds of women in India and South Africa feel the same way. The attitude is also held by large shares of women in countries across the religious and cultural spectra — China, Egypt, Iraq, Nigeria, Peru, the Philippines and Uzbekistan, to cite a few. Even in countries where the vast majority of women don't approve of spousal abuse, the share that do find it potentially acceptable isn't exactly tiny. It's about 1 in 10 in the U.S. and about 1 in 5 in Germany. This societal acceptance of spousal abuse helps explain the continued high rates of domestic violence around the world, Tulchin says. More than 1 in 4 women worldwide have experienced physical or sexual violence at the hand of a husband or intimate partner, the World Health Organization reported in 2013. In sub-Saharan Africa, the share is about 2 in 3, and in North America, it's 1 in 5. Ads Say 'No More' To Domestic Violence, But Will Audience Listen? While the link between women's views and the actual incidence of violence isn't well-understood, Tulchin says that believing spousal abuse is acceptable behavior is a clear risk factor. Women who are victimized are going to be less likely to consider it a crime and report it. Still, she says, the bigger issue is the way a society as a whole views domestic violence. Even if a woman thinks the abuse from her husband is wrong, friends and family around her will be less likely to offer her support if society accepts the abuse as OK. And mothers will be less likely to teach their sons to solve differences with their wives using words instead of their fists. "Social norms and the attitudes that underpin them really are the root cause of violence against women — it plays a huge role," Tulchin says. On the positive side, there's evidence that women's attitudes are changing dramatically in some places. In Nigeria, 44 percent of women said it was all right for a husband to beat his wife in 2003, but the figure dropped to 21 percent in 2013, according to the World Bank. In Benin, the drop was from 39 percent to 10 percent over a similar period. And in Haiti, the decline was from 11 percent to 3 percent. It's hard to pinpoint the exact reason for this improvement in each country, Tulchin says. One factor could be the government's adoption of laws to protect women from domestic abuse. A World Bank report found that in countries with such legislation, women's acceptance of spousal abuse is lower. Just as important, Tulchin says, is for religious and community leaders to talk about the issue at the local level — with men and boys, along with women and girls. This can be done directly or as part of a larger effort that people in the community care about, such as programs to improve overall peace and security in a neighborhood. "The conversation doesn't necessarily have to start with, 'Well, what are the gender norms in your house?' " Tulchin says. "But it gets there eventually, and I think that's hugely important."